On Monday, August 25 the Central Electoral Commission of Abkhazia announced the results of the pre-term presidential election held on the previous day. The former head of the KGB of the Republic Raul Khadjimba has won the election. He has managed to obtain the support of just over 50% of the voters. 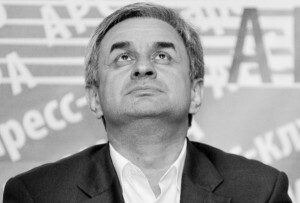 Aslan Bzhania has become the runner up of this election- he obtained 36% of all votes. The other two candidates – Mirab Kishmaria and Leonid Dzapshba found themselves far behind the leaders, obtaining 6% and 4% of all votes respectively. The CEC Chairman Batal Tabagua stated that all votes were counted so there can be no significant changes to the results announced. Observers from almost fifty countries reported no major electoral violations. The only major obstruction to voting occurred at a polling station in Turkey, which was closed by the local police on a pretext that they received a warning of a possible bomb attack. However, the search didn’t last for long so after a short pause the voting continued. Sukhumi officials assumed that this was a case of the behind-the-scenes manipulations of Tbilisi that must have reminded its allies in Ankara that they should be manifesting support to the territorial integrity of Georgia. But since the voting process was actually carried on this allowed Sukhumi to proclaim the “victory of the Abkhaz diaspora in Turkey over the Georgian diplomacy.” The other two Abkhaz polling stations abroad — in Cherkessk and Moscow were operating normally. The result of this presidential election was predictable. It was clear that Raul Khadjimba will be able to gain upper hand in the second round of the election, but he has actually managed to secure a victory in the first one. He has succeeded in obtaining an impressive level of public support which allowed him to become the president of Abkhazia on fourth try. Sergei Markov a member of the Public Chamber of the Russian Federation has confined to NEO that Raul Khadjimba has been able to withstand a punch throughout all of his career, so now one can only be curious about how Khadjimba is going to cope with the presidential challenges he is about to face. The task at hand is the reform of the public administration that fell the victim of Khadjimba’s predecessor Alexander Ankvab who concentrated all power in his hands and single-handedly solved the most petty issues. The newly elected president is going to re-balance the responsibilities of the government institutions by transferring a number of his authorities to the Parliament and the Cabinet. One more important concern — is the improvement of the local economy efficiency levels. This goal is a particularly challenging matter if one is to consider the political status of Abkhazia — it’s a partially recognized Republic, so there would be no easy way of attracting investors. Therefore, some experts believe that this goal can only be achieved by a major liberalization of the legislation and by providing the business elite with certain guarantees. At the same time it is crucial to optimize Russian aid spending by identifying the promising areas of the Abkhaz economy. In fact they have been defined a while ago — those are tourism and agriculture. These are the niches that can in today’s Abkhazian environment that can only be compared to a blockade be more or less developed. However, these areas demand some major legislative changes. In particular, many potential investors are deterred by the fact that the current legislation “does not encourage” the involvement of foreigners in the agricultural sector. Sergei Markov expressed the hope that Raul Khadjimba would be a leader capable of taking the right decisions. “The long political struggle has made him a strong experienced politician. Now he can fully rely on the people’s trust, “- said Markov. According to him, Raul Khadjimba is faced with one major challenge - to consolidate the Abkhazian elite, which, after the most difficult election of 2004 that has nearly drove the country into civil war, has largely remained divided into two camps. “In this quest Sergei Shamba, a former Prime Minister who cannot be attributed to any of the two groups can be of extremely helpful. He took his election defeat three years ago with dignity, therefore he remains an extremely influential politician in Abkhaz society. It seems that the newly elected president is well aware of this fact since he was assisted by Sergei Shamba all through the second half of his election campaign,”- said Markov. Another Russian political scientist, the head of the International Institute of the Newly Established States Alexei Martynov agrees that those evaluations are accurate. He told told NEO that he is curious to see how will Raul Khadjimba manage the creation of a “team of professionals, businessmen and managers that Abkhazia needs today” “The West, as it was expected, announced the lastest presidential election illegal. This was inevitable and the young Abkhaz state could not expect anything else. The principal difference is in the fact that its sovereignty is recognized by Russia, “- said Martynov. According to the head of the IINES, the expansion of recognition is an important tasks, but it’s miles away from being a top priority. “What is really important now is the socio-economic development of the country. In the second stage – the improvement of its diplomatic relations with the neighboring countries: Russia and Georgia “, – told Alexei Martynov. Without a successful resolution of the above stated issues it will be almost impossible to ensure the dynamic development of Abkhazia.